I’ve decided to start unveiling a bit of my intentions and thoughts about pieces that I have written in the past, mostly to be a resource to those that seek it, but perhaps also to be a tool in the discovery of myself. I doubt there will be anything substantially profound in these examinations, but it may answer some questions the performer(s) and conductors may have along the way. This piece was a commission for the 2007 Minnesota All-State mixed ensemble. Dr. Craig Arnold, the wonderful and recent choral professor at Luther College was conducting that year and it was our first opportunity to work together. We had never met, and didn’t until the performance actually, although we connected before the rehearsal process to flush out and clarify some intent. I think they did a fantastic job with a brand new piece of music, and I couldn’t be happier with the premiere. Thanks to the singers, the pianist, and of course Dr. Arnold. I think this piece was, most importantly an experiment in what the role of the piano, could be, or should be in an accompanied choral piece. Up until this point in 2007, a great majority of my choral works had been a cappella. I think it was part of the commission to be accompanied with piano, so I took it as a challenge to be creative. I had the desire to have a piano part not be just outlining harmony, nor be so complicated as to steal any energy from the ensemble. It is hard to pin down exactly my feelings about the use of piano, but I definitely desired to create a unique style specific, and recognizable as me. Looking back, I know now that one of the most important aspects of that style is using the piano to create the momentary universe. It establishes the metaphysical parameters and the emotional context of the piece…yet my hope is always that it somehow contains the many layers of meaning in the text all at the same time. For example in Afternoon on a Hill I wanted the piano to capture both the delight and wonder at the unsurpassed beauty of nature AND the deep and painful understanding of transience…that we are human. Together, in my opinion, these come together to form a great misunderstood emotion: Joy. This paradoxical idea is expertly described by C.S. Lewis in his moving book, Suprised by Joy, I highly recommend it. On a very basic level though, to return to the point, with this piece I began to look at aleatory and different types of repetitive elements to do this “creation” of the musical world. I think this is also one of the first pieces where I started to truly enjoy and employ parallel octaves, which are now a staple of my style. My love of this came directly from the score of the movie The Red Violin. The main theme, which is heard throughout, was played slowly in octaves on the violin, and to me it was the most haunting and powerful sound: the melody had almost a ghosting effect when paralleled by a lower tone. 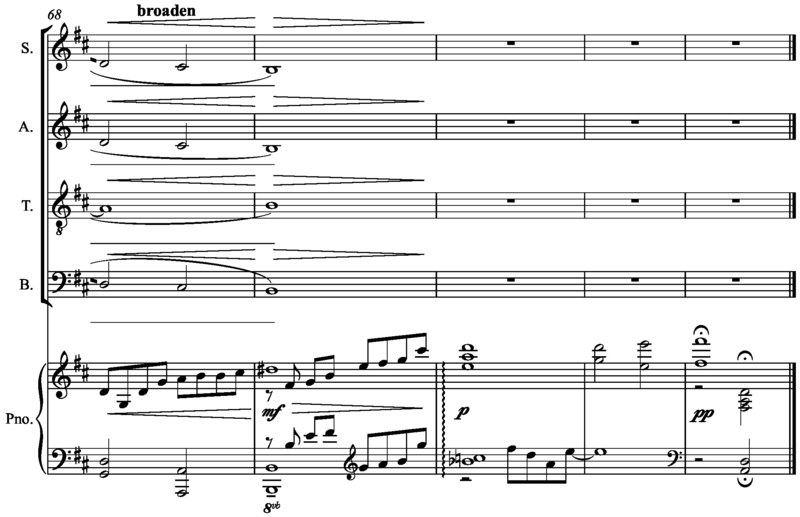 The first, specific time this happens in Afternoon is in m27 with the soprano and alto ‘bursting forth’ out of the texture with the main motif, and all they can sing is “Ah!” for there are no words when the world is this amazingly beautiful. 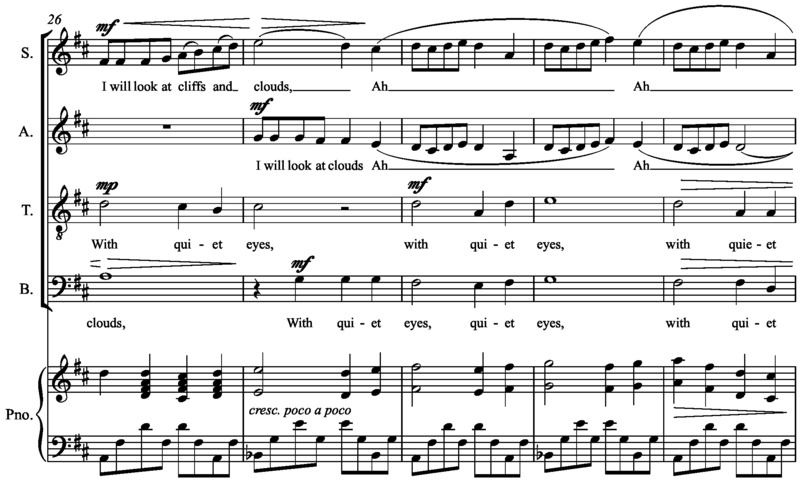 I think making the melody paralleled in the tenor part of the dramatic climax “I will touch a hundred flowers” makes it seem quite strong, instead of using them to fill out harmonies or create more color. This is from Salvador Dali’s The Persistence of Memory. In 1982, Dawn Ades wrote, “The soft watches are an unconscious symbol of the relativity of space and time, a Surrealist meditation on the collapse of our notions of a fixed cosmic order.” The look of them on the canvas truly is the physical manifestation of what is happening in the music when I use them. Time is somehow bending, or melting. I have used it even recently in such pieces as Across the Fields and The Sounding Sea, and certainly there are subtle variations in the micro meaning when affiliated with the text, but on the macro level, the slides are time-related. Examination of the pocket-watches above actually is an open door into how I feel about the meaning of this poem. I didn’t want to focus on the pastoral sensibilities it possesses. There were a couple ideas of greater intrigue to me: transience, transformation, and nostalgia. (This is primarily the reason for the minor 6th pervading the piece). The first words are so poignant. St. Millay answers the question: What would a person who is the gladdest thing under the sun act like? Well, they would touch a hundred flowers and not pick one. They would look and watch. To start with, this is the essence of fully engaging without being falling prey to a consumerism. It also allows Time. Time to sit, time to be quiet and allow….there is no rush, no scurry and scamper. (…allowing time to allow…huh, never thought of that before today.) In fact, so much time passes, that twilight soon descends. It also allows a peace free from worry, free from the assailing arrows of self-esteem culture. 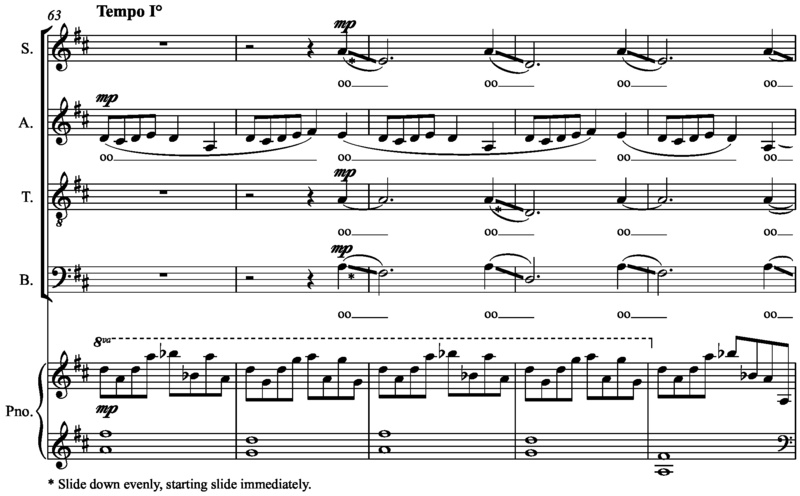 There are quite a few musical metaphors of transition of day to night in the closing bars of the piece, and I suppose on some levels it leaves one with an ominous sense. My wife Danielle really disliked the ending of the piece for quite some time after I showed her the piece. She is a beautiful and light spirit, who wants the hilltop scene to never end! Something about this poem kept speaking to me of something more, something dramatic that takes place after the experience…or could take place if you allowed it. An understanding, an unraveling of some greater truth. I have to reference C.S. Lewis again here, he captures it perfectly in Suprised by Joy : “…Joy, which is here a technical term and must be sharply distinguished both from Happiness and from Pleasure. Joy (in my sense) has indeed one characteristic, and one only, in common with them; the fact that anyone who has experienced it will want it again. Apart from that, and considered only in its quality, it might almost equally well be called a particular kind of unhappiness or grief. But then it is the kind we want. I doubt whether anyone who has tasted it would ever, if both were in his power, exchange it for all the pleasures in the world. But then Joy is never in our power and pleasure often is.” This must be the reason I composed m68-69 this way! But look how fleeting it is. Only one measure. Lewis agrees with this notion of our fleeting ability to hold on to Joy. We have no power over it, it comes sometimes only fleetingly, and with it comes layers upon layers of meaning and substance to make one weep. In conclusion, here is another performance performed by the University of Washington Chamber Singers under the direction of Dr. Geoffrey Boers. I truly like this performance (though the film is captured by a phone, so the quality is not quite 100%). So many subtleties are ‘just right’ to me – the tempos, intent, etc. This doesn’t mean that the infinite varieties of performances aren’t as powerful or fantastic, so explore and create!